The Consumer Financial Protection Bureau (CFPB) has issued its formal proposal to change to effective date of the TILA/RESPA Integrated Disclosure (TRID) rule to October 3, 2015. The implementation date had been moved due to an administrative error that would cause the implementation date to be postponed by 2 weeks. The date was pushed another 2 months to allow for a smoother transition to the new rule. The new implementation date was originally reported as October 1st but has been moved once again to be implemented on a Saturday, like the original implementation date. This is to allow industry to launch new systems configurations and to allow for time to test systems. The rule requires integration of the early Truth in Lending and the Good Faith Estimate into the Loan Estimate, and the Final Truth in Lending and the Settlement Statement into the Closing Disclosure. The industry has spent the last few months scrambling to update not only the disclosures but the systems they have in place to meet the new rules, which include disclosure of the Loan Estimate 3 days after application and disclosure of the Closing Disclosure 3 days prior to closing. The proposal is open for comment until July 7th, with a final decision to follow shortly thereafter. We look at industry happenings and updates every week. 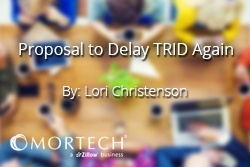 You can read last week's post on the first proposal to delay TRID, here.